A personal case study: one website or two for your freelance business? My work consists of many tasks, serving many clients. Is it best to stick with one website or to split my efforts? In this post, I explore what I’ve learned so far – and why I’m changing my strategy. In the beginning, things were straightforward: I had a blog about my climbs and walks, which evolved into a platform for my writing. Things changed in 2014 when I established Pinnacle Editorial. Suddenly I had completely different goals: rather than connecting with readers, I was looking to grow a fledgling business and find editorial clients. In 2014 and 2015 I wanted to attract aspiring indie novelists. This was a very different audience to the established readership of my main blog. It made sense to set up a separate website at that time. The site I created was barebones and focused on getting key information across as simply and clearly as possible. There was also a blog where I published articles on writing and editing – albeit far too infrequently. My main website, alexroddie.com, continued as before, with a blog mainly about mountaineering and backpacking. I was maintaining two websites for two very different and clearly defined audiences. The strategy was clear, and by and large it worked – for a while. In 2016, Pinnacle Editorial started to undergo significant changes. My work was diversifying. In late 2014 all my income came from editing novels, but by 2016 I was earning an increasing amount from my writing, and the rest came from a blend of private editorial clients and freelance work with magazines. This shift was no accident. I had identified my niche: outdoor and adventure non-fiction. As I moved away from editing novels, the new potential clients I was looking to attract were completely different. Increasingly, I saw that the audiences for the two sides of my work – the writing and the editing – were starting to overlap. After all, people who love reading about adventure often write their own adventure stories too. As I hustled to carve this niche out for myself, I started to question why I was maintaining separate websites for what I increasingly saw as two sides of the same business. Maintaining one blog can be challenging enough, but when I run two I find that one inevitably suffers. The Pinnacle Blog never took off because I never made the time to post regular quality material there. Running two different social media presences was similarly difficult. A second website adds to the overall expense and maintenance overheads for your web presence. It’s another site to keep updated and secure; another design to tinker with when you’re in the mood to procrastinate. Eventually, I became discouraged by the fact that pinnacleeditorial.co.uk never achieved any traction. Keeping its dedicated Twitter and Facebook pages up to date was an unwelcome burden at a time when my workload was expanding rapidly, and I reasoned that – if intelligently done – Pinnacle Editorial could thrive without its own website or social presence. I deleted Pinnacle Editorial’s Facebook and Twitter accounts. I took the core information from my editorial website and added it to a section in alexroddie.com. I promised myself that I’d expand the topics covered in my blog to add content for potential clients, not just people who liked to read about the outdoors. Again, I reasoned that the audiences were now similar, so there would be an appreciable overlap. Right now, Pinnacle Editorial can be found under the ‘Editorial’ tab on the menu bar above. This section of the site includes information for prospective clients, an editorial portfolio, and a handful of testimonials. There’s also a link to my feature portfolio. The problem is that the vast majority of visitors to the site never click on this tab – and my plan of diversifying content on the blog never really got implemented. Why? 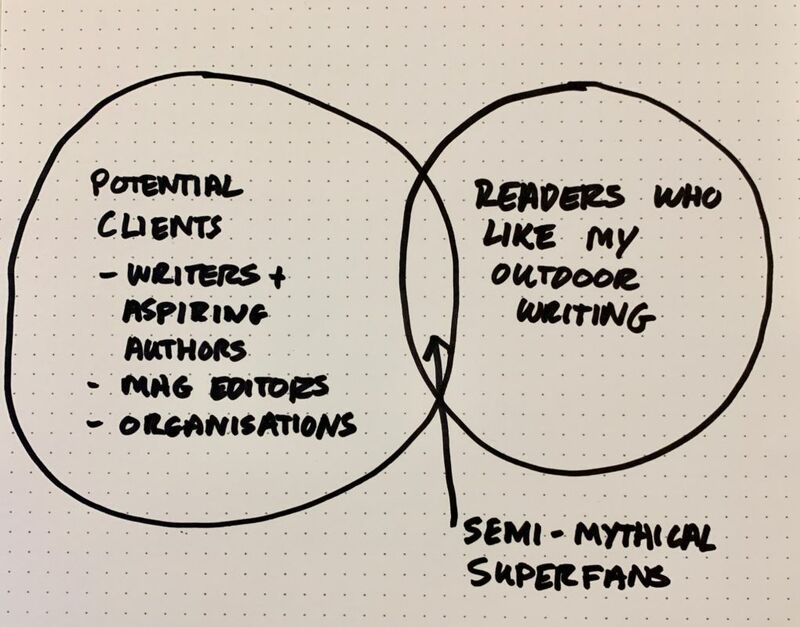 The truth is that, while there is indeed an overlap between the audience for my writing and the audience for my editorial stuff, it isn’t as big an overlap as I’d originally thought. On the rare occasions when I’ve published blog posts aimed squarely at aspiring writers, the posts have fallen flat. It’s clear that most visitors to alexroddie.com just want to read about the outdoors – and who can blame them? I’ve worked hard to build up resources aimed at hillwalkers and long-distance backpackers. It’s become known as a ‘hiking blog’. Since this is an important part of what I do, I’m ok with that. But I can’t neglect the other side as well. While my workload has only continued to grow – largely thanks to a huge increase in magazine work – the number of queries I’ve been receiving from new prospective clients has declined. I’m at no risk of running out of work any time soon, but I can’t ignore the fact that I’ve been taking on fewer new private non-fiction clients. For well over a year now the bulk of my work on books has come from established clients. Since big book projects are what pay the bills, this indicates a problem. The problem with my marketing for Pinnacle Editorial is simple: I haven’t been doing any. Since most of my editorial work currently comes from established clients, and I’m always in demand, I haven’t bothered with any direct marketing for more months than I can count. The only exception to this is my Pinnacle Newsletter, a weekly email aimed loosely at aspiring outdoor writers. Although this newsletter is increasingly successful, it’s clear that I need a more organised approach. I need to acknowledge the fact that the people who want to read about hiking the Haute Route Pyrenees may not be the same people who want help with perfecting dialogue – the people who might be interested in hiring me for my editorial credentials, not my outdoor exploits. While there’s a lot of value in having an editor with an expert background in your subject, it isn’t the only factor. 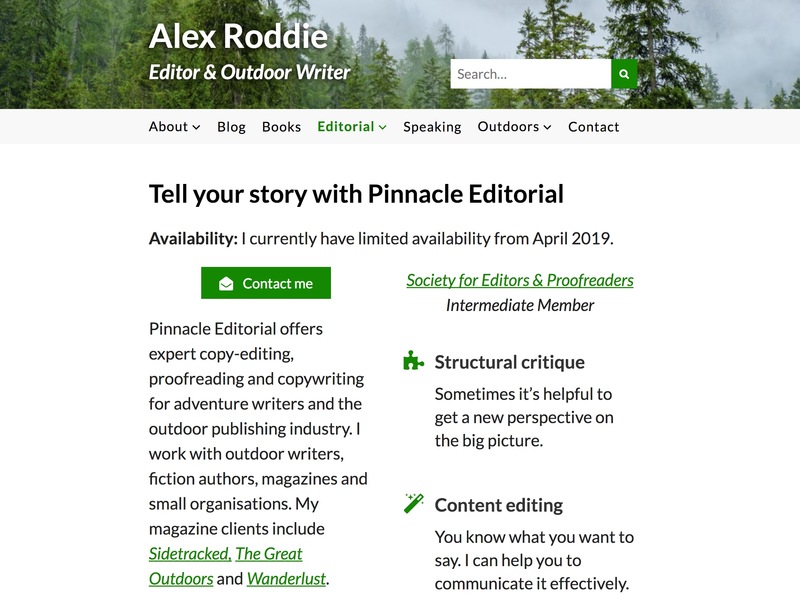 This website, alexroddie.com, will revert to its original topics: my hiking, long-distance backpacking, outdoor writing, and public speaking. In practice, most visitors will notice little difference. 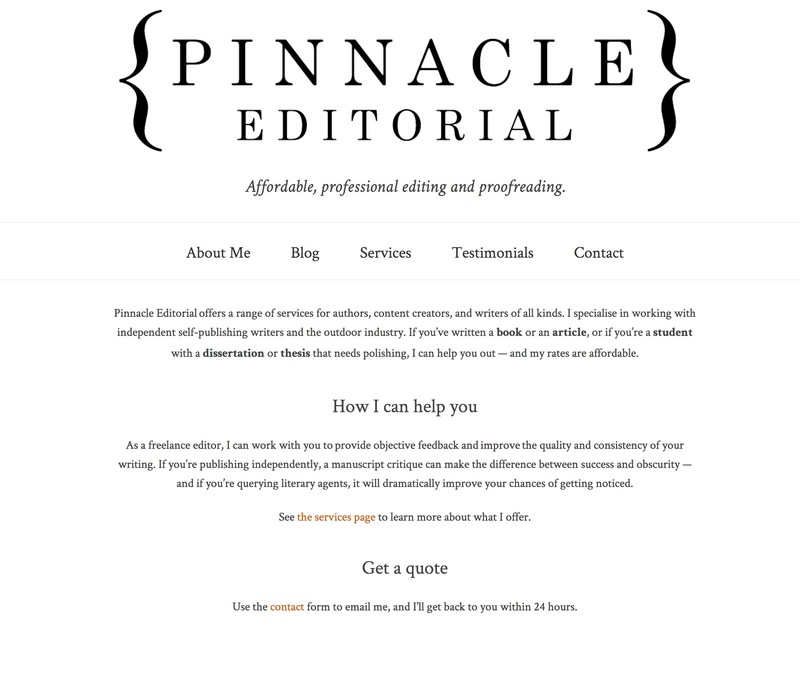 I’ll construct a new site under the old URL, pinnacleeditorial.co.uk, which will contain information about my editorial business, my editorial portfolio, and a blog aimed at aspiring writers. I’ll implement an achievable blogging schedule focused on quality rather than quantity. I will not set up new social accounts for Pinnacle Editorial. I’ll keep doing what I’m currently doing on social media. I think social media is at its best when it’s about people, not brands; my Twitter account is me, not my business. So… should I have separate websites for my separate businesses? It isn’t an easy question to answer. If you offer two very different services to the same potential audience, or the same service to different audiences, I’d say there’s a case to be made for keeping everything on one site. But if you find yourself offering different services to two completely different types of client – or the overlap isn’t as big as you originally thought – then a distinct website for each business may help keep each message clear and prevent visitor confusion. However, be aware of the downsides. As a small business owner, your resources can only go so far, and running two websites could dilute your efforts. Having tried both sides, my advice is to consider all angles carefully, and then commit to a course of action. If you decide to split your websites later on, as I’m doing now, you could be faced with the headache of building up traffic and SEO for one of the businesses from scratch. Freelance editors and writers: have you found yourself in this situation? How did you decide to resolve it? I’d be interested to read your comments.